Dear Ruby, Will write a letter to you. I hurt my finger on my right hand, could not write. Do not worry yourself about the mortgage. I'll take care of it - Will write. Elenna [Addressed to] Mrs. Ruby Evans, 13 Third St., Willoughby Ohio [printed on back] Located about eight miles south of Portland in the fashionable, residential and recreational district of Oswego Lake. Fine homes nestled in this wooded area border on the shores of this beautiful lake. "C. T. art colortone" Reg. U. S. Pat. Off. - Wesley Andrews Co., Portland, Ore. 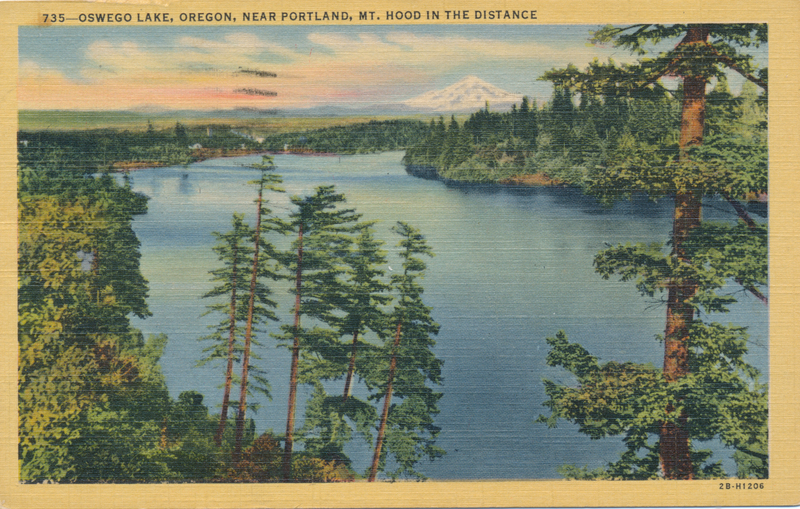 Description On front of postcard: 735 - Oswego Lake, Oregon, near Portland, Mt. Hood in the distance. 2B-H1206. Card is postmarked July 11, 1946. Transcription Dear Ruby, Will write a letter to you. I hurt my finger on my right hand, could not write. Do not worry yourself about the mortgage. I'll take care of it - Will write. Elenna [Addressed to] Mrs. Ruby Evans, 13 Third St., Willoughby Ohio [printed on back] Located about eight miles south of Portland in the fashionable, residential and recreational district of Oswego Lake. Fine homes nestled in this wooded area border on the shores of this beautiful lake. "C. T. art colortone" Reg. U. S. Pat. Off. - Wesley Andrews Co., Portland, Ore.